Vegetable Pakora with a cup of masala chai is comforting food on a pleasant winter evening. A vegan recipe that makes for a great party finger food. The standard Vegetable Pakora recipe calls for the use of mixed vegetables, chick pea flour and carom seeds. But I tend to tweak the recipe and add a few more spices to pep up the flavor. In today’s Vegetable Pakora recipe, I used carrots, beans, cabbage and potatoes but you can also add raw plantain, eggplant, caulilfower and pumpkin. Make sure to use fresh firm vegetables. 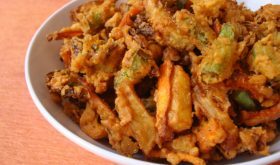 Chickpea flour and carom seeds are essential ingredients that make the pakoras visually appealing and appetizing. But do add an extra ingredient, dry fenugreek leaves aka kasoori methi to your pakora batter which will elevate the flavor of the pakoras by leaps and bounds. It adds depth of flavor and keeps you coming back for more. In a bowl, add the chickpea flour with salt, chili powder, ginger garlic paste, carom seeds and hot oil. 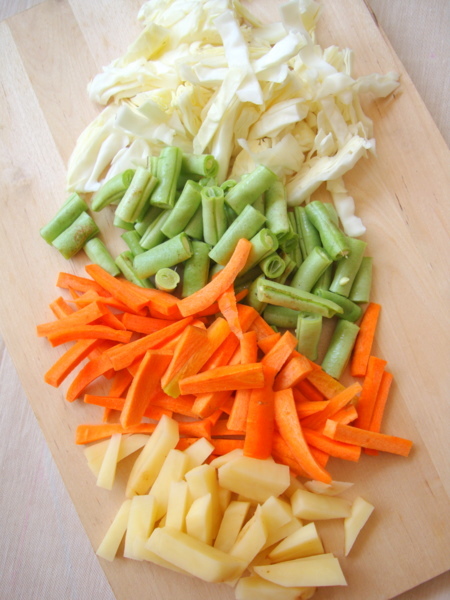 Add the thick julienne mixed vegetables to this mixture and mix. Add little water and mix well that it coats the vegetables. Do not add too much water. Heat enough oil for deep frying in a heavy bottomed vessel. It should be piping hot. Do the sizzle test. (Drop a little chick pea batter into the hot oil, if it sizzles and comes to the surface of the vessel, then the oil is ready for deep frying). Carefully drop the chickpea flour coated julienne vegetables into the hot oil. Do not overcrowd the vessel. Reduce heat to medium and deep fry till they turn golden brown. Use a ladle to turn them so that they cook all over. Once they turn golden brown, remove on to absorbent paper. Serve as evening snack over a hot cup of masala chai. Adjust the quantity of chickpea flour according to the vegetables. Add few tbsps water at a time while making the batter. It should be like a paste that coats the vegetables and not like a runny mixture. You can add a pinch of roasted cumin powder. Use curry leaves if you do not have kasoori methi. If you do not have both curry leaves and kasoori methi, omit them and follow rest of the recipe. By Sailu Published: December 9, 2011 Vegetable Pakora with a cup of masala chai is comforting food on a pleasant winter evening. A vegan recipe that makes for a great party finger food. 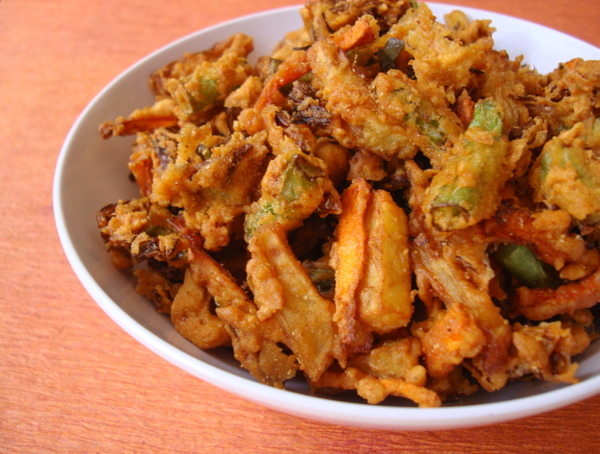 The standard Vegetable Pakora recipe calls for the use of mixed vegetables, chick pea flour and carom seeds. Yammy. No need of onions for this recipe? Great recipe. I think you mean “elevate” the flavour of pakoras. Awesome recipe…will surely try it…love the new look of your recipe page! Feel like finishing that whole bowl,super crispy pakoras.. Yes, besan is good enough. No need for rice flour. If you want to add rice flour too, add 1-2 tbsps. Love this template! Looks very organized and is definitely easier to follow! Love the point wise presentation of the recipe in a template.Thanks a lot ! ahaaa…luks so tempting Sailu…In dis cold…it would surely b a feast to the taste buds!! 🙂 lovely pics…lovely recipe!! thanks!! Whats the alternative to Chickpea flour? My daughter is allergic to Besan..
Well explained. Really looking lovely i’ll must try..
Love it.. Thanks a lot yaar..
can we boil the vegies first and then coat them with the batter? I can’t view the measurement for this recipe. Can you please add?